Answers to frequently asked questions about the Excel application and Excel files. For example, "Why does Excel say that my file has links?" and "Why do the column headerss show numbers, instead of letters?" Error message "Compile error in Hidden Module"
Excel files have become "read-only"
File with that name is already open. Excel crashes on opening- "not enough resources". Chart Fill pattern does not print. More than 256 columns and/or 65536 Rows. 16 digit credit card number cut off. When I start Excel, why do files open up automatically? Click the Advanced category, and scroll down to the General section. In the box for 'At startup, open all files in', you might see the name of a folder, and its path Clear the folder information from that box (or go to that folder and remove the unwanted files). 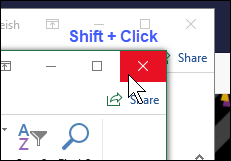 Click OK, to close the Excel Options dialog box. If there was nothing listed in the Startup box, the unwanted files might have been accidentally saved to one of the XLSTART folders. In Windows Explorer, go to those folders, and remove the unwanted files, to prevent them from opening automatically when Excel starts. Choose Tools > Options and select the General tab. All files listed in the "At startup, open all files in:" box will be loaded when Excel starts. Alter or remove this list. When I start Excel, I get the error message "Compile error in Hidden Module"
An add-in with a programming error is causing problems. Got the error? Uncheck the one you last checked. If no luck, see if there's an .xla file in the startup directory (see previous tip). Scanner software typically place itself there, sometimes with code errors like the one in question. Not an add-in? It will be a hidden workbook then. Try (in Excel) Windows, Unhide and write down which files are listed. Now go to the VBE (press Alt + F11). On the left side there should be the project explorer. No Errors? Select the next project listed, repeat 6. Some of my Excel files have become "read-only". Clear out c:\windows\temp directory on the machine that houses the files, then reboot. An Excel file began opening two copies of itself. If I close one of the copies, both close. Any changes made to one copy show up in the other. This sounds like you just have two windows open that are displaying the same workbook. OR, you can close the extra window by clicking the lower of the two X buttons in the upper right corner of the screen (don't click the top X button, as that will close Excel). Then save the workbook. When I click on an Excel file to open it, the file opens but an error message is displayed that says a file with that name is already open and that I can not open two files open with the same name. If you are sure it's not really happening (you may have Book1 open and then attempt to open a Book1 from another folder), then try re-registering Excel. Type "C:\Program Files\Microsoft Office\Office\Excel.Exe" /regserver (include the quotes) -- adapt to fit your path. Why does Excel say my file has links, when I know it doesn't? You might find Bill Manville's free FINDLINK.XLA program useful -- you can get it from the Excel MVP page, on Stephen Bullen's web site. Type "C:\Program Files\Microsoft Office\Office\Excel.Exe" /Automation (include the quotes) -- adapt to fit your path. If your error disappears, there is either an add-in or a (hidden) workbook that is loaded upon XL's start, which is causing problems. Try locating the XLSTART directory, move everything from there. In XL, Tools, options, general. Check if a path is entered after "Alternate startup file location". Clear it. Now try and start XL again. Excel crashes on opening / closing / prompts "not enough resources". 1. Close Excel (if it managed to open). How do I close all the open files in Excel 2013? Here are a few ways to close all open windows in Excel 2013 and later versions. Thanks to Alex Blakenburg for suggesting the shortcut options. 1. Add the missing "Close All" and "Exit" commands to the Quick Access Toolbar. 2. Press the Shift key, and click the X at the top right of one of the Excel windows. You will be prompted to save any unsaved files, and then all the windows will close. 3. Press the Alt key, and tap the F key, then tap the X key. When you press Alt+F, the File tab is activated. Even though the X shortcut doesn't appear in the list, the Exit command runs when you tap X. 4. 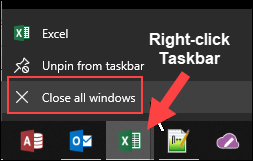 Right-click the Excel icon in the Windows Taskbar, at the bottom of your screen. Then click the Close All Windows command. 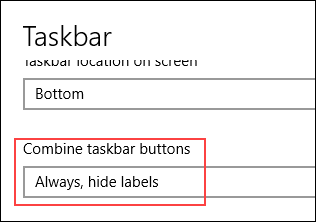 NOTE: This only works if the Taskbar has "Always, hide labels" as the setting for "Combine taskbar buttons: To change that setting, right-click the Taskbar, and click Taskbar Settings. 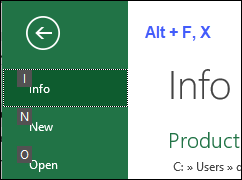 Alt+F4 shortcut closes the active Excel window, and also closes Excel. Why do the column headers show numbers instead of letters? To see why this happens, and how to switch the column headings back to letters, watch this short video tutorial. The written instructions are below the video. Click the Office button, and click Excel Options. How can I change the font in the column and row headers? When you create a new file in Excel, the row and column headers are displayed in the Normal font for your workbook settings. The Normal font is also used in the worksheet cells, unless you select a different format in the cells. You could even change the row and column headers to pictures, by changing the Normal font to a graphic font, such as Wingdings. Then, instead of referring to cell J1, you can put good news in the "Happy Face Folder" cell. 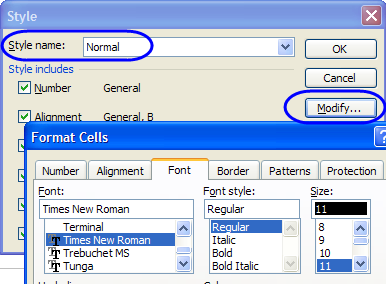 Remember to format the cells in a non-graphic font, after you change the Normal style. In the Styles group, click Cell Styles, to open the Cell Styles palette. 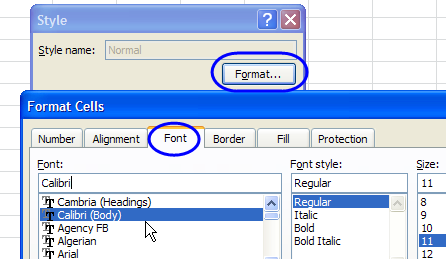 Click the Format button, and select the font and font size you want for the Normal style. Click the Font tab, and select the font and font size you want for the Normal style. How can I change the color of the sheet tabs? 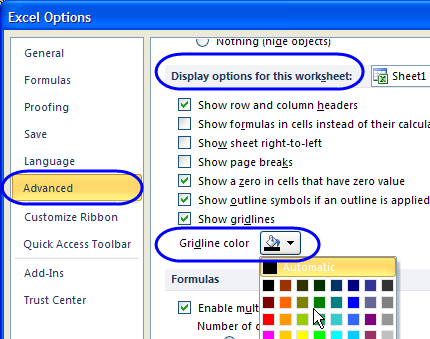 Note: When the sheet is selected, the colour will show in a thin strip at the bottom of the sheet tab. The full tab is coloured for non-selected sheets. How do I lock in my Title Row and keep it visible while I scroll down to see the rest of my data? You can use the Freeze Panes command to lock rows above the selected row, and columns to the left of the selected column. Note: If cell A1 is the active cell, the freeze point will be in the centre of the Excel window. To see the steps for freezing the headings with the Freeze Panes command, and the problem with hidden rows, please watch this short video tutorial. Written instruction for all versions are below the video. Select the row below the section that you want to freeze. Then, on the Ribbon's View tab, click Freeze Panes, and click the Freeze Panes option. 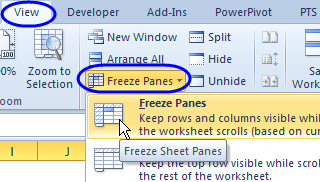 There's a very short video here that shows how to freeze panes in Excel 2007. NOTE: Before you freeze the title rows, make sure that all the rows in the top section are visible, if you want to see them after freezing. For example, if Row 1 is out of view, you won't be able to scroll up to that row later. On the Ribbon's View tab, click Freeze Panes, and click the Unfreeze Panes option. 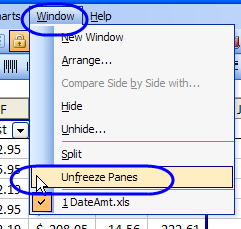 Assuming title row is 1, select cell A2, then choose Window > Freeze Panes. On the Menu bar, click Window >Unfreeze Panes . Why did my Freeze Pane settings and gridline settings disappear? When you lock the title row(s) in place, as described above, those settings should stay in place, if you've saved the file. However, sometimes the freeze pane setting, or the gridline setting, disappears, even though you haven't changed the settings. This can happen if you open a second window in the same workbook, and then you close the original window, which had the settings. If you do open a second window in a workbook, make sure to keep the original window open, and close any other windows, when you're finished with the multiple windows. In the screen shot below, the original window is on the right, and it has a freeze pane setting (1) and hidden gridlines (2). 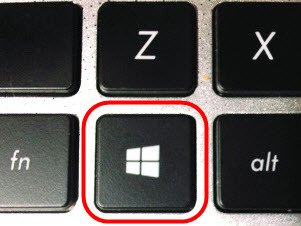 Leave it open, and close the window at the left, where the default settings are shown. Why do my scrollbars go to row 500 -- my data ends in cell E50? Excel may be remembering some data that was in row 500, but has been deleted. To go to the cell which is currently the "Last Cell" in the worksheet, hold the Ctrl key, and press the End key. If the Last Cell (cell J500 in this example) is outside the range of cells that is actually being used, you can reset the used range, so the scroll bar works correctly. Note: If any cells contain references to the deleted cells, those references will be replaced with a #REF! error. If you have cells that are formatted, but outside the range that contains data, the formatting will be lost. Move down one row from the last cell with data. Select Entire Row, click OK.
Move right one column from the last cell with data. Select Entire Column, click OK.
Save the file. Note: In older versions of Excel, you may have to Save, then close and re-open the file before the used range is reset. Note: This code may not work correctly if the worksheet contains merged cells. To check your worksheet, you can run the TestForMergedCells code. 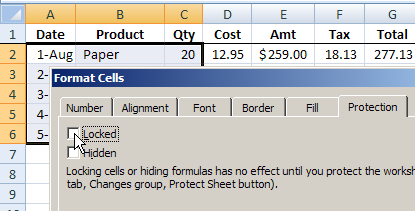 MsgBox "never gets here--only 3 options"
When I apply Fill colour to a cell, I can't see it on the worksheet. However, the colour shows up in Print Preview, or when I print the worksheet. What's wrong? When I apply Fill pattern to a chart, it looks okay on the worksheet. However, the pattern disappears when I print the worksheet. What's wrong? Fill patterns were designed for older printers with low resolution. Today's printers may print the patterns in such fine detail, and so small, that the pattern sometimes disappears. If you really, need to print patterns, you could roll your own, using white rectangles, with transparent border, and lines, etc. Note: In Excel 2007 the chart feature for Fill Pattern was deprecated. Use Andy Pope's free Pattern Fill Add-in to restore the pattern feature. By default, charts do not display the data in hidden rows and columns, but you can change a setting to make the data appear in the chart. How can I change the gridline color on a worksheet? 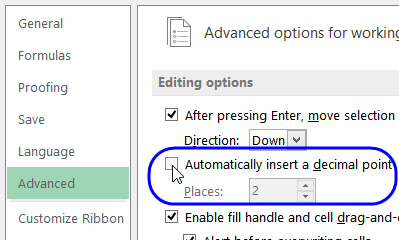 Click the File tab in the Excel Ribbon, then click Options. Click the drop down arrow for Gridline color, and click on the color that you want, then click OK to close the window. How can I hide the Excel Ribbon, to make more room on the worksheet? You can temporarily hide the Ribbon, leaving only the tabs visible. To hide the Ribbon commands, double-click on one of the tabs. You can see the steps in this short video. How do I remove the big "Page 1" on my worksheet? When the worksheet is in Page Break Preview mode, the page number is shown in the centre of the sheet. You can't remove the number in that view, but you can change to a different view, such as Normal view. 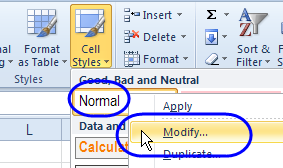 In Excel 2007 or later version, click the Normal icon, at the bottom right of the Excel window. Or, on the Ribbon's View Tab, click the Normal command. I need more than 256 columns and/or 65536 Rows. In Excel 2003, and earlier versions, that's the limit. Excel 2007 has 1,048,576 rows and 16,384 columns. How many worksheets I can put in a workbook? 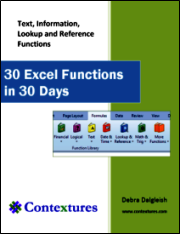 There is not a set limit in the Excel specifications, but there is a practical one which depends on the computer resources. How many characters can be placed in a cell? In Excel 97 and above, you can have up to 32K characters in a worksheet cell, but only the first 1000 or so are displayed (the exact number depends on your font and display characteristics). However, you can increase the number of characters displayed if you add line breaks in the cell (press Alt+Enter). How can I protect formulas from being deleted or changed? Select all cells that users ARE allowed to change. On the Protection tab, remove the check mark from Locked. Well, there are passwords and there are passwords. yet another one is to unprotect the Excel VBA macro code. 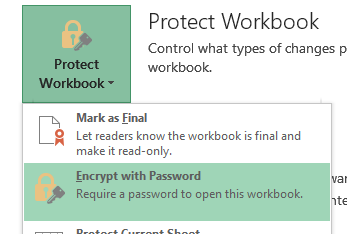 File and VBA passwords cannot be cracked by a "normal macro", workbook and worksheet passwords are fairly easy. A search for "excel password" at https://www.google.com/ will find both commercial and free solutions of varying quality and brutality. How can I protect an Excel file (and associated code) from unauthorized copying and/or create time limited functionality? There is no foolproof method for this, and most solutions limit themselves to require macros enabled on opening. This said, creating your own system is a fun challenge allowing lots of "evil creativity". 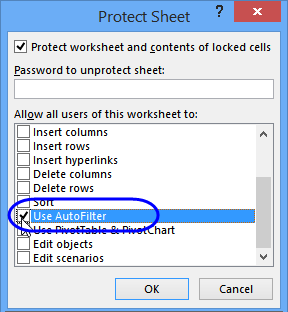 Is there a way to allow the use of AutoFilter on a protected worksheet? When you protect the sheet, add a check mark to the option for "Use AutoFilter". Can I prevent people from opening a file without a password? In the Encrypt Document dialog box, type a password, then click OK.
Re-enter the password in the confirmation box. NOTE: Microsoft can't help you recover lost or forgotten passwords, so keep a list of your passwords in a safe place, or you could be locked out of a protected file. When I type a number, it is automatically divided by 100. For example 44 becomes 0.44 even if I format the cell without decimals. Click the Options command, then click the Advanced category. In the Editing Options section, remove the check mark from "Automatically insert a decimal point", and click OK. NOTE: In Excel 2003, go to Tools>Options/Edit and uncheck the Fixed decimals checkbox. When I clear a large range , it takes forever. How can I make it faster? If you have Google Desktop Search installed, turn it off in Excel. How can I prevent hyperlinks from appearing when I type an email address? Immediately, press Ctrl+Z. This is a shortcut for Undo, and will convert the hyperlink back to text. you can use the Convert with Paste Special technique. Watch a short video that shows the Change Excel Hyperlinks to Text steps. The code below, when run on a selection, will also delete the hyperlinks. When I import information from my merchant account the field which holds the 16 digit credit card information does not display it properly. Excel only maintains 15 significant digits for numbers and cannot be used for credit cards which require 16 digits. If you don't need to do math on them, input long numbers into a range that you've formatted as text (Format>Cells, Number tab). To prevent both of the above issues (hyperlinks and 16-digit numbers) -- as well as entries that are automatically converted to dates (e.g. 3/4) -- type a single quote ( ' ) before the entry. Excel will treat the cell as pure text and change nothing. I just began to design an intricate spreadsheet and after over an hour got an error message in Excel - which then closed automatically. Unfortunately, I did not save my file. Excel did not automatically recover the file. Is there anything I can do to get it back? No. There should be an Autosave add-in in Tools > Add-Ins menu that you now might consider start using. (But then again, you may not want to overwrite an existing file with every little test you do in it, so be careful). Jan Karel Pieterse has an add-in Autosafe.zip downloadable from https://www.oaltd.co.uk/MVP/Default.htm. See also David McRitchie's https://www.mvps.org/dmcritchie/excel/backup.htm for more on backup and recovery. Finally, Excel XP has great backup and recovery tools, so upgrading is a good future solution to those problems. Perhaps you were using the keyboard to put a line break in a cell, with Alt + Enter. If you accidentally hit the Window key, instead of Alt, that turns on the Windows Narrator in some versions of Windows. To turn this feature off, press the Window key and tap the Enter key. Original FAQs compiled by Harald Staff, Excel MVP 2000-2005. Revisions and additions by Debra Dalgleish.